The Cathedral of St. John the Baptist is a Roman Catholic cathedral at 222 East Harris Street, Savannah (GA). It is the Mother Church of the Roman Catholic Diocese of Savannah. The colonial charter of Savannah prohibited Roman Catholics from settling in Savannah. The English trustees feared that Catholics would be more loyal to the Spanish in Florida to than the English in Georgia. This prohibition faded shortly after the American Revolution. This congregation was reorganized about 1796. French Catholic emigres established the first church in 1799, having arrived from Haiti after an uprising on that Caribbean island. 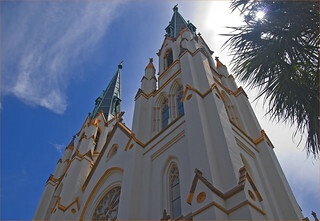 A second church was dedicated in 1839 as the number of Catholics increased in Savannah. Construction began on the new Cathedral of St. John the Baptist in 1873 and was completed with the addition of the spires in 1896. The structure was nearly destroyed by fire in 1898 but was rebuilt by 1899.